I really couldn’t wait to get started on Katherine Longshore’s Brazen! I had heard really great things about this author, so I was super excited to start reading the book. Especially since it was said that fans of the TV show ‘Reign’ would really enjoy the book, and I love that show. I really, really enjoyed reading this novel, and now that I’ve read it, I can’t wait to check out Gilt and Tarnish. I wish that I would have had time to read these books before I started Brazen, but I’m definitely excited to check them out now. The story in Brazen revolves around Mary Howard, who was a lady’s maid to Anne Boleyn during her marriage to Henry VIII, and who was also married off to Henry’s illegitimate son, Henry Fitzroy. I knew absolutely nothing about Mary when I started reading this novel, and to be honest, I was a bit worried at first that she was just going to be a weak young lady that let everyone run over her. But she proves over and over again through the novel that that was not the case. She was strong and determined and had the heart of a fighter. I love the relationship between her and Fitz, and wanted so much more for them, because they were wonderful when they were together. I also loved the friendship between Mary and Madge, and even the one that she formed with Margaret. Even when I things were at their worst, they never really gave up on each other. Mary’s story is a bittersweet one, one that doesn’t have the best of endings, but that will make you love her even more. I really loved the historical storyline in this book. I haven’t read too many novels at this point regarding royal history, but I definitely find it fascinating, especially the people in history. I kept putting the book aside so that I could search for information on each character because I wanted to know so much more about them. And it wasn’t only the people in history that I had to stop and look up, but events as well. It was such a fascinating time period, although not one that I could ever imagine living in. I also love that most the events in the novel that happened between Anne Boleyn and Henry VIII are events that happened in real life. And even though I knew how some of these events ended, they still managed to shock me throughout the novel. With such interesting characters and a fascinating storyline, this book made for a really great read. Overall, I really enjoyed this book, and now I’m dying to read more by this author! 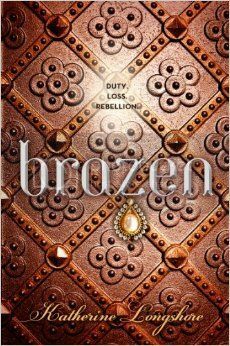 If you’re looking for a really interesting historical fiction book to read, I highly suggest that you consider adding Brazen and its predecessors to your reading list. I just finished this book last week and thoroughly enjoyed it as well. I thought it was great, but I actually liked Gilt a bit more….I hope you can read that one as well. Longshore is fantastic at bringing the Tudor Court to life. I am so glad you liked this book! Great review, Christy! I love Tudor history and fiction in that time period but I haven't read any from this series yet. I am glad you liked it and I am definitely planning to give this series a try. I'm so happy that you enjoyed this one! I think Katherine is a wonderful historical fiction writer and I've enjoyed all three of her Tudor books. I think of the three, I waver between this one and Tarnish as my favourite, so I hope you get a chance to read it (and Gilt) soon and that you like them too!